SINGAPORE -- Oil prices bounced off four-year lows to near $43 a barrel Monday in Asia after OPEC's president suggested the group could surprise investors with a large production cut later this month. Light, sweet crude for January delivery was up $2.01 to $42.82 a barrel in electronic trading on the New York Mercantile Exchange by midday in Singapore. The contract fell Friday nearly $3 to settle at $40.81. 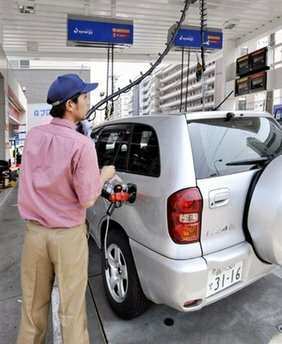 Prices fell as low as $40.50, levels last seen in December 2004. Chakib Khelil, president of the Organization of Petroleum Exporting Countries, said Saturday the group could announce a "severe" reduction of output quotas at its next meeting on December 17 in Algeria. The OPEC head would not specify how deep the output cut would be, but noted that some analysts are predicting a decrease of as much as 2 million barrels per day. An output decision that startles markets would help bolster plunging oil prices, Khelil said. "The best way is to surprise them," he said. "I hope it will." OPEC will likely cut production by at least 1 million barrels a day, said David Moore, commodity strategist with Commonwealth Bank of Australia in Sydney. "The possibility of OPEC moving to tighten up the oil market is real," Moore said. "As we get closer to the meeting, people may get more wary that OPEC may make a large cut." OPEC announced a production cut of 1.5 million barrels a day in October and investors largely ignored it, focusing instead on a global economic slowdown that has weakened crude demand. President-elect Barack Obama warned Sunday that the US economy, which saw the worst job data in 34 years on Friday, would get worse before improving. The price of oil has fallen about 70 percent since peaking at $147.27 in July. "Pessimism about the international outlook has remained intense," Moore said. "Concerns about weakening oil demand have not gone away. You have to look at today's movement in the oil price in light of the ferocious decline over the past week." In other Nymex trading, gasoline futures rose 4.37 cents to 94 cents. Heating oil gained 4.35 cents to $1.47 a gallon while natural gas for January delivery slid 15 cents to 5.59 per 1,000 cubic feet. In London, January Brent crude rose $2.12 to $41.86 on the ICE Futures exchange.